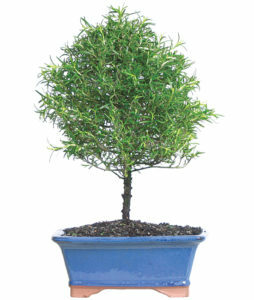 A Rosemary Bonsai is a perfect office plant as it displays fresh greenery inside while remaining unfussy and able to thrive in low light. Earlier this year, we mentioned some of our favorite ways to bring plants and flowers indoors, and now as the days are becoming shorter and it’s getting darker earlier, we need as much brightness we can get! The easiest way to spruce up indoor spaces is by integrating fresh flowers and plants into your work spaces. Whether choosing to add plants to keep your office looking fresh or sending a bouquet as a surprise gift to coworkers or clients, flowers are always a great choice! When purchasing office flower arrangements, bouquets, or centerpieces, there are a few aspects to consider: longevity, freshness, and the office space itself. Centerpieces can last longer than bouquets or fresh arrangements as do lush, green plants such as bonsai. For Fall, our Rosemary Bonsai is a very festive choice as rosemary’s woodsy, aromatic scent is reminiscent of fall roasts and cool weather feasts. It is also a hearty plant that can withstand varying climates, making this particular bonsai easily adaptable in any office. Our Mediterranean Bouquet keeps on giving as the vase is a food safe pitcher that can be used for multiple purposes. Our Mediterranean Bouquet is also a fun choice in terms of longevity as the pitcher vase will continue to be beautiful decorative item. 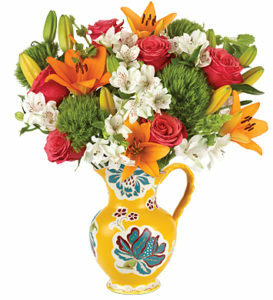 After the recipient enjoys the bouquet of bright lilies and roses, the food safe, hand painted pitcher can be used in a number of ways such as serving water to clients or to simply place near a window or entrance for a cheerful addition to greet customers. Care is also important to keep in mind when adding plants or flowers to an office. An office flower arrangement or plant that requires less care is usually preferable in an professional setting. With busy workloads, it can often be difficult to remember to water plants or be cognizant of complex plant care instructions. Low-light plants are an excellent option for easy care. Offices often lack an abundance of natural light making it difficult for delicate plants that need a lot of sun. Bonsai and heartier plants fare well in both dim and artificial light and also require less watering, another advantage in an office. 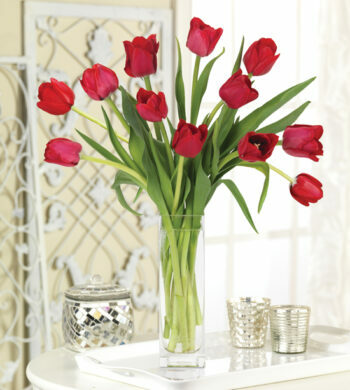 Bouquets also make a great choice in terms of freshness and care. 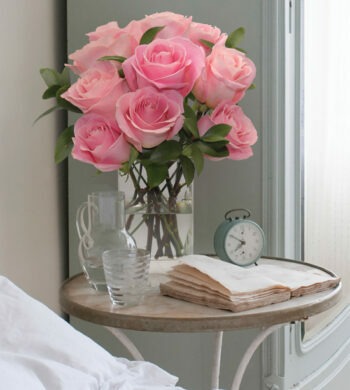 Fresh flowers always invigorate any indoor space, and because bouquets have shorter lifespans than plants, there is always the option of ordering fresh blooms often to keep things feeling new. The Cornucopia Bouquet makes a wonderful office addition with its eye-catching colors while the tall vase add texture and structure make watering and care convenient. One bright option is our Cornucopia Bouquet which captures the essence of Fall with luminescent colors and sprays of wheat. 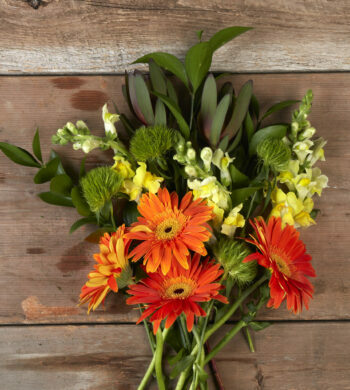 With dryer elements like sprays of wheat and hypericum berries, this bold bouquet is easy to care for while leaving your home or office feeling refreshed. 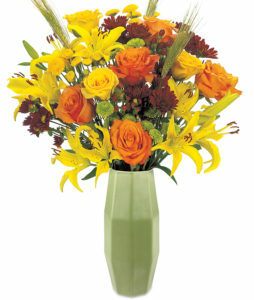 The soothing, green vase the Cornucopia Bouquet arrives in is also helpful in terms of freshness and care. 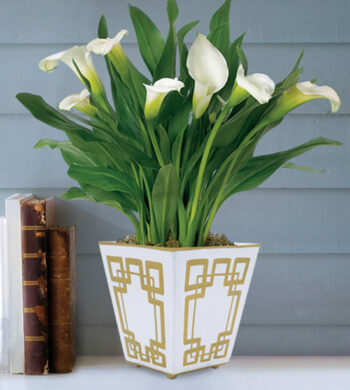 This ceramic vase is tall to provide more structure and shape so rearranging stems and watering is more convenient. Centerpieces are the simplest to care for and are often made of preserved elements, making them ideal for corporate settings. They are also a perfect way to add décor to a conference room or large table in need of something festive. Inspired by nature, our Walk in the Woods centerpiece contains dryer elements such as feathers and maple leaves for easy care and a striking centerpiece for a conference table or entryway. Our Walk in the Woods Centerpiece hits all these marks. 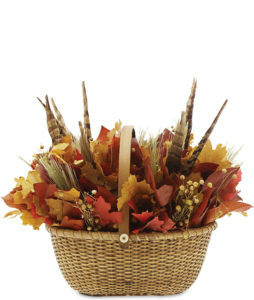 Arriving in a rustic wicker basket, this fall centerpiece evokes a crisp fall day outdoors, with colorful maple leaves and elegant pheasant feathers for a perfect presentation of autumn. This centerpiece would look wonderful on a conference table or an entryway bringing the beauty of nature to both your clients and employees alike as they walk in for a day of work. As always, Calyx Flowers is proud to be where you turn for quality plants and flowers. Your office arrangements should feel inviting to your clients and your employees. Find what fits your style, whether it is luxurious or classic, and shop our favorite office floral arrangements and gifts to find just what you’re looking for.